One of the biggest new features destined for the Samsung Galaxy S10 and Galaxy S10 Plus has been unmasked at Qualcomm's annual Technology Summit in Maui. 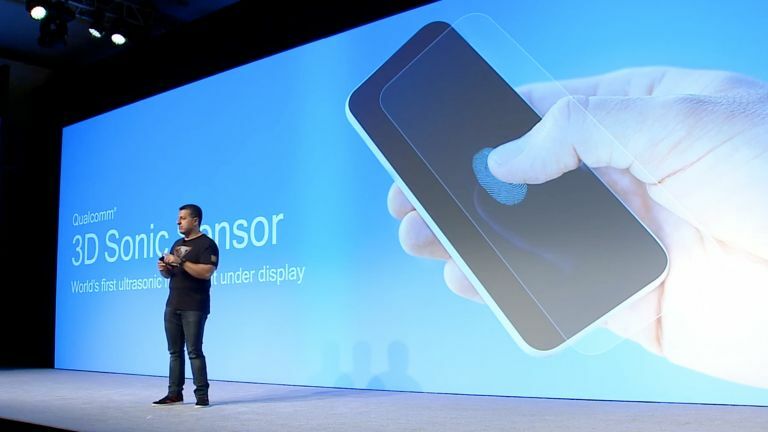 Qualcomm unveiled its new ultrasonic scanner, which can read and authenticate fingerprints through the glass display on the front of a smartphone, on-stage during its Technology Summit. The component – which tallies perfectly with the long-rumoured feature headed to the next entry in the Galaxy S series – will begin shipping in mobile devices in the first half of 2019, Qualcomm announced. Qualcomm has branded its innovative new fingerprint scanner "3D Sonic Sensor". Unlike traditional optical sensors, the ultrasonic variant from Qualcomm does not compare the print against a two-dimensional pattern previously stored. Instead, Qualcomm's all-new 3D Sonic Sensor creates a three-dimensional mould of the fingertip by bouncing soundwaves off the skin through the display. According to Qualcomm, the sensor can capture a breathtaking amount of detail – down to the individual ridges and pores. This makes it far more accurate than optical sensors that compare the pattern of the fingerprint. Of course, the security community has yet to perform real-world tests to push the sensor to its limits, so it's difficult to judge whether the 3D Sonic Sensor is a genuine leap forward in security for mobile devices. However, from a technology perspective alone, it seems like the new Qualcomm component should eradicate the possibility of fooling a smartphone fingerprint sensor with an accurate image of the print. According to months of whispers from the supply chain, Samsung will include an ultrasonic sensor with its next-generation flagship smartphone. The security benefits of the new system could be a strong differentiator compared to rival handsets likes the Huawei Mate 20 Pro and OnePlus 6T, which favour optical sensors. Elsewhere, the Galaxy S10 and Galaxy S10 Plus are tipped sport a truly all-screen design, with only a small circular cut-out in the AMOLED display for the front-facing selfie camera to peep through. Samsung is expected to use a triple-camera system on the back of the phone, bringing wide-angle shots as well as improved bokeh-blur blur to the background of Live Focus portrait photographs. According to some sources, Samsung is also considering ditching the 3.5mm audio port.